The Map: The title and some of the information on the original map is what is written on the left hand side of the painting including the date it was created. 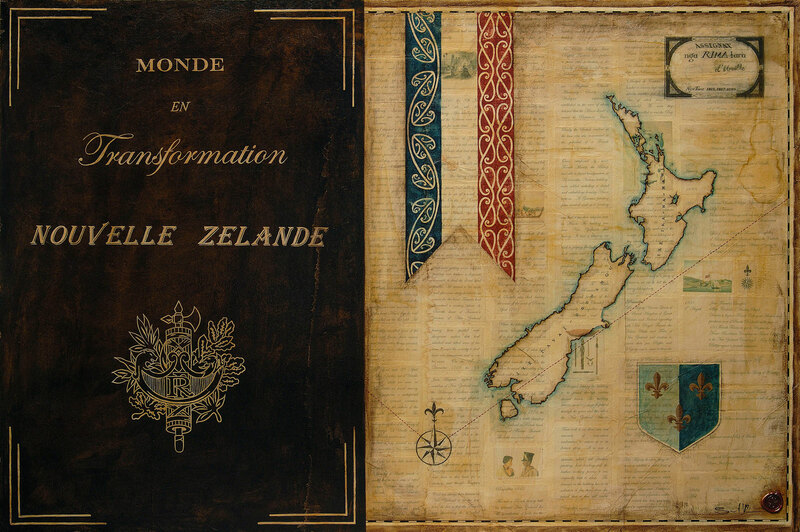 The original map was done by Vincendon Dumoulin on the discoveries made by d’Urville during his visits in New Zealand. Fleur-de-lis: The design can be found in many places long before heraldic times, as far back as Mesopotamia. It is essentially a stylized flower, and served as a decorative element and became associated over time with royalty, especially in the High Middle Ages. The Roman Catholic Church ascribed the lily as the special emblem of the Virgin Mary. Due to its three “petals,” the fleur-de-lis has also been used to represent the Holy Trinity. Joan of Arc carried a white banner that showed God blessing the French royal emblem, the fleur-de-lis. 1) United Tribes of New Zealand. This flag was created before New Zealand was a British Colony. March 20, 1834, 25 Chiefs from the Far North gathered at Waitangi to choose the flag to represent New Zealand. Kowhaiwhai Design: Patiki or flounder. This is a symbol of hospitality from the Pare Hauraki area. The kowhaiwhai is done in a pale blue to be reminiscent of the French colours used during that period.